Here comes another repurposed review, for your perusing pleasure. Art Style: Precipice (or Art Style: Kubos, overseas) is yet another little slice of downloadable (DSi) heaven from the lovely lads at Skip. It's a really cool physical puzzle game. Sort of like Mr. Driller in reverse. Or Congo Bongo meets Tetris (meets Q-Bert?). Blocks fall in a small 3-D grid, and you manipulate a minimalist 3D stick figure character to 'paint' each block by walking over it and climb ever upwards without getting squashed or falling into nothingness (when the bottom layer drops off). You can also reshape the field by pushing or pulling blocks. The game is intuitive, simple, and fun, with a nice dash of added complexity by way of Bomb Blocks to defuse, Energy Blocks to harvest, and a limited Blast move. Because of the deliberate speed of movement and telegraphed block drops, Precipice has a measured, strategic feel, which belies the underlying tension in a very interesting way. 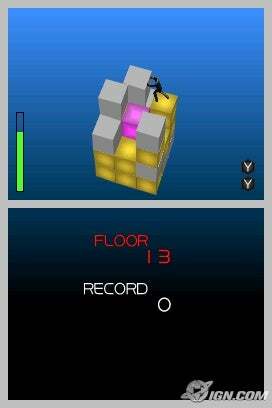 Precipice has a Ten Floors score attack mode and an endless Tower mode which tasks you to climb as far up as you can. The rules in each mode (and even the dimensions of the playfield) are quite different, which gives the game a bit of variety. It certainly isn't the most content-rich title on the DSiWare service, but I find it to be quite replayable, and very easy to jump into at any time. It has earned a permanent spot in the valuable real estate of my internal DSi memory. My only issue with the game is that the scoring system in Ten Floors mode is just too dependent on randomness to be truly rigorous. My best-scoring games have always, always been based off of the initial couple of block drops. If the blocks fall in an easily navigable pattern and you can manage to max out the combo meter there, everything else you do during the course of the round becomes kind of insignificant, in terms of scoring. That's my experience, anyway. I guess it's possible that some crazy savant could keep it maxed throughout the entire game. But the Tower Mode has a scoring mechanic that is much more balanced and fair, and I find both modes enjoyable, overall, so it's a small gripe. Like many Art Style games, Precipice also has a crazy unlockable extra: the Relax mode. It seems to consist of mime routines using the featureless stick figure avatar, with appropriate environmental sound effects to enhance the illusion. One of the little men I unlocked was riding a non-existent train. I don't know what's in Skip's water supply, but I like the results. More games need mimes. I feel that, of all of the wonderful, overlooked games on DSiWare, Art Style: Precipice is one of the most wonderful and most overlooked. Highly recommended. Which games should have changed industry direction, but didn't? Sounds like fun. This'll be the next Art Style game I go for on DSiWare. Hmm, tried to download this last night but I was out of space. Can you believe Base 10 takes up nearly 100 blocks!? Nintendo has GOT to work on making their games smaller, they easily take up the most space in my DSiware collection. Base 10 is one of the bigger games, for whatever reason. Music, maybe? It is a pretty full-featured game, though. Nintendo's games are generally the most elaborate ones on DSiWare, though, I think. Invisible trains. Awesome. I just wish I had a DSi. The gameplay sounds pretty addictive, kind of makes me wonder why I've never seen anything like this before. Just got this game, and it's pretty addictive. I failed a lot until I realized you could push and pull blocks! D'oh! I quite enjoy the gameplay. It's a little light on content though...for some reason I expected "stages" to be completed but it's essentially two high-score modes (one endless). Still, it seems like the perfect 10-15 minute high-score attack game.